On a recent on-line material hunt we checked out the Associated Press media website following up on a haunch press images of the event may be found. 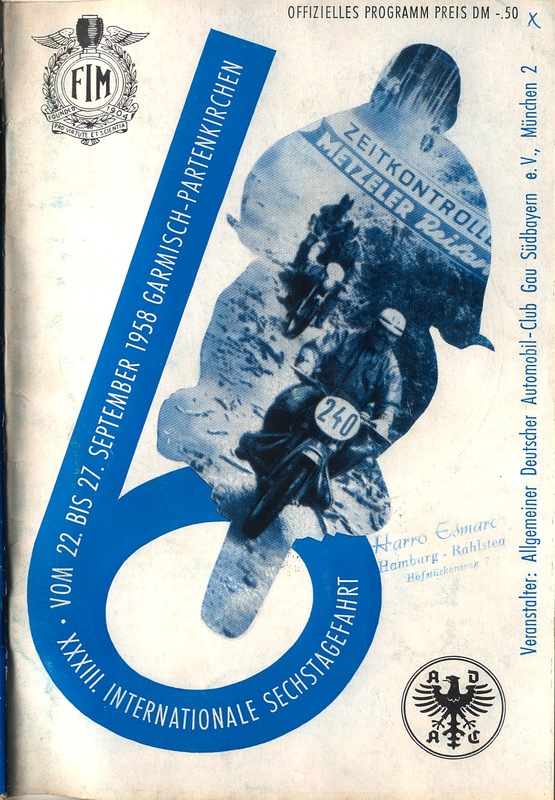 Almost immediately we stumbled over a video clip labeled as ‘Poland International Trial’ watching the clip the first bike to pass by was a Matchless and a quick check about enabled us to put riders numbers and bikes together using the 1958 programme so we are pretty certain this is the 1958 ISDT held in Garmish Partenkirchen, West Germany in 1958 you can see other video clips of the event in our video gallery. This copy of the event programme is from a collection of documents that were gathered by the late Mr Harro Esmarch a German Motorsport Journalist and historian and have now been passed to our reliable european correspondent ‘STB’. As ever we are endebted to the many generous readers of this web blog about the ISDT for the gift of copies of the important documents and reports on the events which help many to recall past times as well as those like myself who were not there but want to know more or may be researching a project related to their family or the restoration of an old classic bike once ridden in the event. Without our contributors like ‘STB’ who has donated large amounts of often exclusive content to us much of the history the site protects would remain lost. Here we have a copy of the official programme of the ISDT 1958 event. In addition this copy has been annotated by hand to list corrections to rider machines and teams where they changed between the date of publication and event registration. Using our issuu.com library we can let those on devices that support ‘flash’ software the ability to read the original copy. If the below embedded image cant be accessed you can find a direct link to the file here. 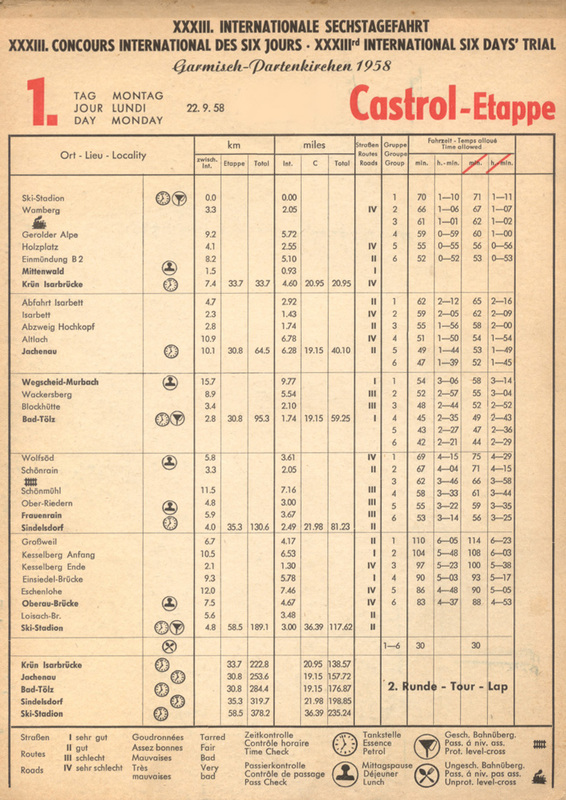 Again I remain indebted to my European Researcher and top ISDT consultant ‘STB’ who has allowed us to access these daily route sheets for each day of the ISDT 1958 from the archive collection of the late Mr Harro Esmarch.